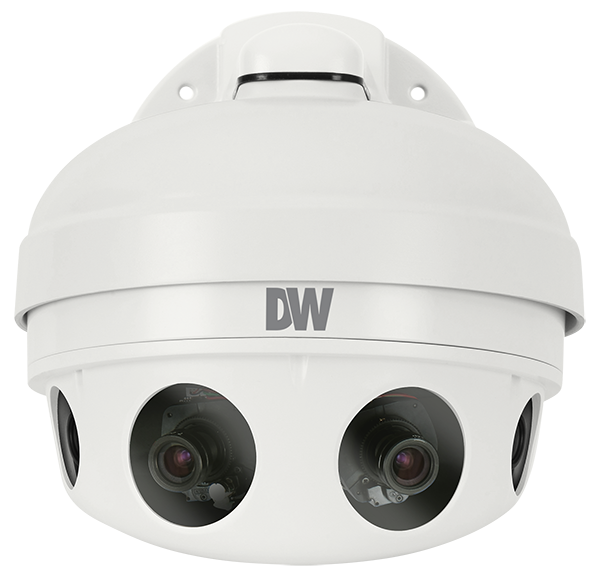 ISC West 2016 — Las Vegas, NV (April 6, 2016) – DW®, the industry leader in digital recorders, surveillance cameras and related management software, has announced that the world’s only 48MP multi-sensor camera is available for order. The MEGApix PANO 48MP 180° View Camera will be demonstrated at the ISC West Security Industry Trade Show, April 6-8, 2016, in Las Vegas, Nevada, Booth 17089. Four 12MP sensors are configured for 180° panoramic views and deliver video streams at up to 30fps using a single network connection. The multi-sensor MEGApix PANO 48MP 180° View Camera completely redefines panoramic imaging in terms of resolution, performance and usability. The camera uses four 12MP CMOS sensors (the equivalent of four 4K video streams simultaneously) and four 7.2mm auto focus fixed lenses to produce 180° panoramic views at up to 15fps at 48MP and 30fps at 32MP resolution via a single PoE Plus network connection. The revolutionary PANO 48MP camera provides lower TCO and superior ROI for both wide area surveillance and detailed zooming, replacing the need to install and monitor multiple cameras. The camera’s advanced technologies include remote alignment and field of view adjustment (for a seamless “stitched” appearance), Smart DNR™ and True Day/Night with mechanical IR cut filters, delivering unbeatable image quality. The camera comes in an IP66-rated weather resistant enclosure with anti-reflective glass and CleanView™ Self Cleaning Technology. DW® empowers our customers as the industry-leading single source of value-driven complete solutions for all video surveillance applications (analog / hybrid / IP enterprise), focusing on ease of use and ROI. DW® products offer technologically-advanced features including Star-Light™ super low light technology, WDR, Smart DNR™ and Smart IR™. Complete IP megapixel surveillance solutions include single- and multi-sensor MEGApix® cameras and edge recording systems, Blackjack™ NVRs and DW Spectrum™ IPVMS for server, mobile and on-camera control. Complete analog surveillance solutions include single- and multi-sensor STAR-LIGHT AHD™ 1080p and STAR-LIGHT MPA™ 1.3MP 960H cameras, VMAX™ DVRs and mobile management applications.